Micro combustion, i.e., combustion under characteristic length smaller than the classic quenching distance, behaves much different from macroscale combustion. Short residence time with a low Reynolds number, significant wall heat losses and non-neglectful near-wall radical quenching due to increased surface-to-volume ratio lead to serious flammability and flame stability problems. In this, planar quartz micro combustors (channel height: 0.7/1.0/1.5 mm) have been developed for the study of thermal effects on micro combustion with laser diagnostics. The combustion channel is fusion-bonded with black quartz for absorption of radiation heat from IR lamp heaters, so combustion in the channel is investigated under controllable wall temperature by tuning the external heat input to the walls. Effects of the channel height and the wall temperature on quenching distance and extinction limits are investigated. 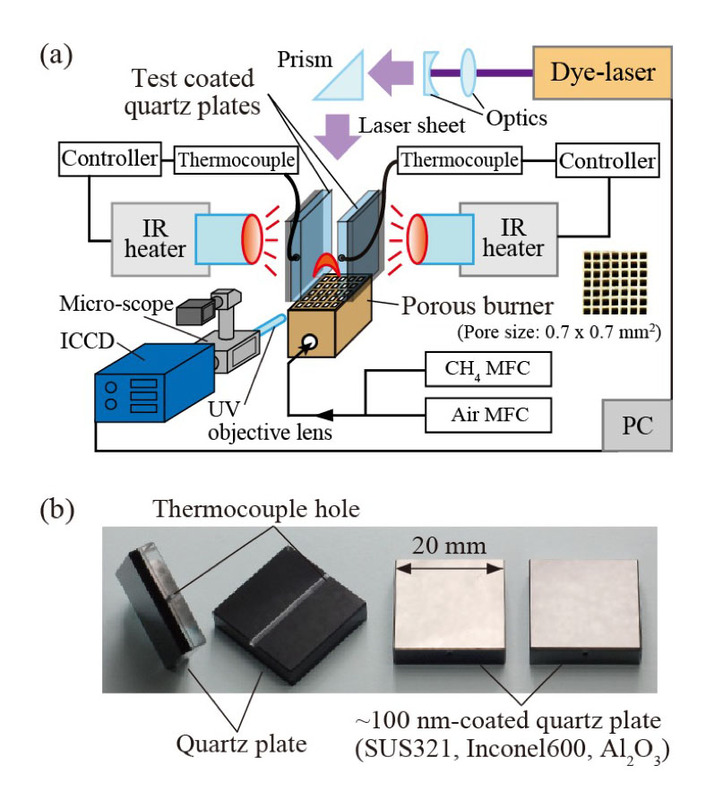 Time-resolved CH*/OH* chemiluminescence imaging, phase-locked OH-PLIF and OH 2-line method have been developed for the capturing of flame propagation with flame speed and flame temperature information. It is found that the oscillating flame observed for rich mixture is quenched by heat losses from the flame to adjacent walls, which is verified by the flame front deceleration and temperature drop during the upstream propagation. In order to elucidate effect of wall material on chemical quenching behavior, a methane-air premixed flame formed in 5-mm-wide channel is investigated. In the present study, platinum, quartz, alumina and chromium are chosen as the wall materials. Platinum, chromium and alumina thin films ~100 nm in thickness are deposited on quartz substrates using sputtering, vacuum arc plasma gun or atomic layer deposition techniques to establish equivalent thermal boundary condition with different wall chemical reactions. OH-PLIF/micro-OH-PLIF and numerical simulation with detailed reaction mechanisms are employed to examine interaction between the gas-phase and the wall surface reactions. It is clearly shown through the PLIF measurements that OH* mole fraction in the vicinity of the wall is the highest for alumina, while it is increased in order of quartz, chromium, and platinum. On the platinum surface, the gas-phase combustion is suppressed due to fast consumption of the reactants by the catalytic reaction. On the other hand, on the other surfaces, radical quenching cause the reduction of OH* near the wall. By using a radical quenching model, the initial sticking coefficient associated with radical absorption is evaluated. It is found that radical quenching does exist on the quartz wall, while the alumina surface works as an inert surface. In addition, pulsed arc discharge is employed to generate OH on demand, in which the spatio-temporal development of OH under wall chemical effects can be precisely studied. 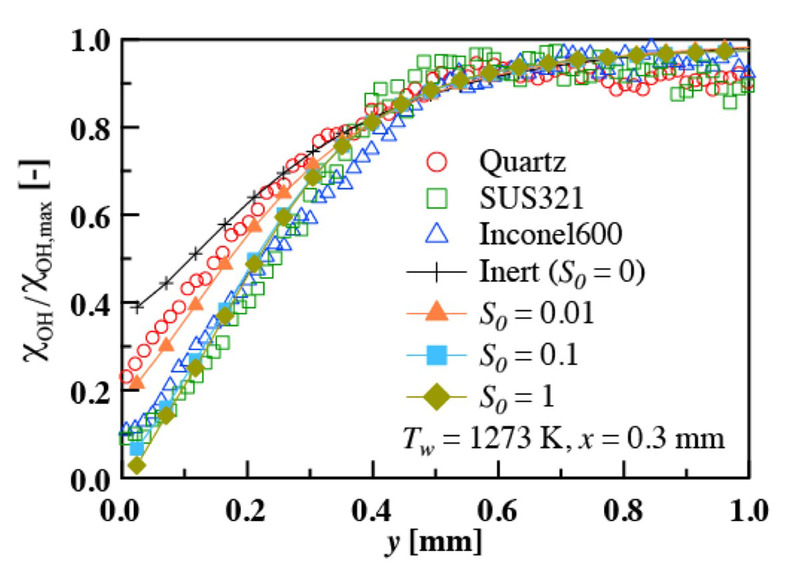 OH distributions over quartz plates with thin films of different materials are measured with LIF in synchronization with the pulsed discharge. The wall temperature is kept constant up to 900 °C with an external infrared lamp heater. OH development under different wall thermal/chemical conditions is examined in detail. 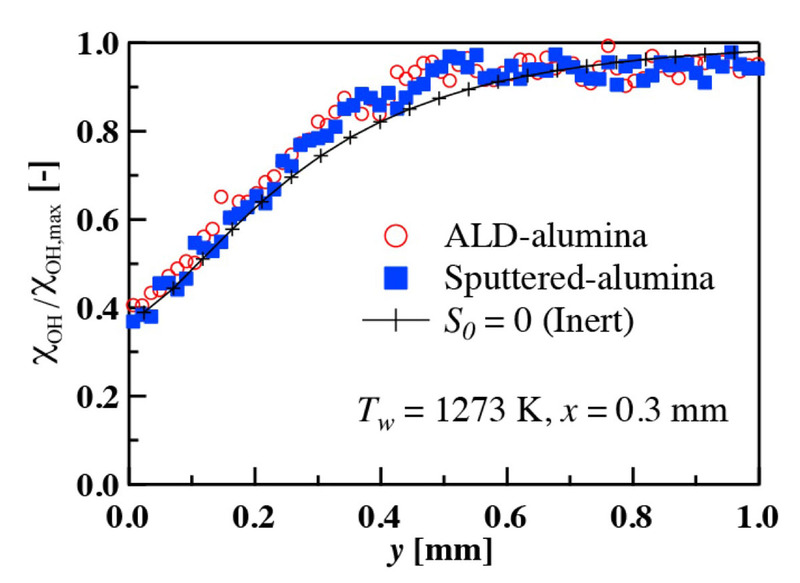 "Evaluation of H-atom Adsorption on Wall Surfaces with a Plasma Molecular Beam Scattering Technique,"
Proc. Combust. Inst., Vol. 37, pp. 5569-5576, (2019). J. Phys. : Conf. Ser., Vol. 1052, 012040 (2018). Combust. Flame, Vol. 196, pp. 255-264 (2018). Combust. Flame, Vol. 162, pp. 4036-4045 (2015). Proc. Comb. Inst., Vol. 34, Issue 2, pp. 3395–3402, (2013). Proc. Combust. Inst., Vol. 37, pp. 1749-1756, (2019). Proc. Combust. Inst., Vol. 37, pp. 5655-5662, (2019). "Quenching Mechanism Study of Oscillating Flame in Micro Channels Using Phase-locked OH-PLIF,"
Proc. Comb. Inst., Vol. 33, No. 2, pp. 3267-3273 (2011). 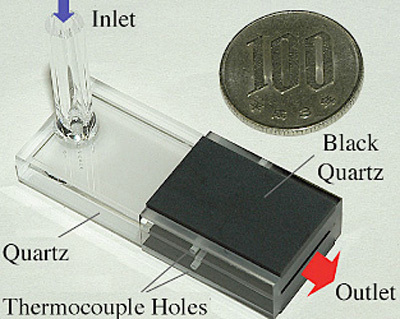 "Experimental Study of Micro-scale Premixed Flame in Quartz Channels,"
Proc. Comb. Inst., Vol. 32, Issue 2, pp. 3083-3090 (2009). Comb. Flame, Vol. 158, Issue 7, pp. 1391-1403 (2011). Kwan, T., Lee, M., Morimoto, K., and Suzuki, Y. The 9th International Conference on Modeling and Diagnostics for Advanced Engine Systems (COMODIA 2017), Okayama, Japan, Jul. 25-28, (2017), A203. "Development of MEMS Wireless Wall Temperature Sensor for Combustion Studies,"
Meas. Sci. Tech., Vol. 28, No. 3, 035101 (2017).